Kurdan gro-Dragol is an Orc barbarian living in Bravil, where he can be found hanging out at The Lonely Suitor Lodge. He runs a deadly game of man hunting out at nearby Fort Grief. Meanwhile, Ursanne Loche's husband, Aleron, has gone missing and happened to owe Kurdan quite a bit of money. Kurdan will be disabled until you have talked to Ursanne Loche about her missing husband. Then he will book himself in at the Lonely Suitor Lodge and spend most of his time wandering around on the second floor, looking for potential prey for his hunter clients. He will only break off his simple routine at 8pm when he heads down to the taproom and enjoys a two-hour dinner. He was supposed to sleep between midnight and 6am but doesn't, due to a bug. When you reach stage 75 of the related quest, he will relocate to Fort Grief where he will wander around, awaiting your appearance. When you finally show up, he will kill Aleron and, after a brief conversation, proceed to attack you. 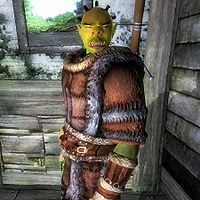 He wears a set of leveled armor that includes cuirass, boots, gauntlets, and greaves and carries two pieces of regular, randomly chosen upper-class clothing. After level three, any of the armor may be enchanted. He wields a leveled and possibly enchanted two-handed weapon. He also carries a respawning piece of food and a big sum of gold. When you meet him at Fort Grief, he will also have the real key to the fort in his inventory. When you try to question the big Orc about Aleron, it becomes apparent that he is more than unfriendly: "None of yer damn business. I'd tell you if I liked you... and I don't." After you have raised his disposition accordingly and asked him the same question, he will prove more talkative and make you a deal: "Maybe I know him, maybe I don't. But since yer so interested, I know somethin' that could jar my memory. I just learned that a family heirloom, the Axe of Dragol, which one of my stupid relatives lost, is located on Fort Grief Island in Niben Bay. My informant tells me it's hidden in the main keep at the center. Dunno what's guardin' it, but I'm sure you can handle it. If you go there and bring it back to me, I'll tell you exactly where Aleron is." If you carefully ask him what happens if you do not bring him the axe, he will say: "Then Aleron may not be coming home from his... ahhh, journey, for a very long time. Like permanently. Whenever yer ready, and it better be soon, I'll have a boat waitin' for you to get to Fort Grief Island." When asked about Aleron at this point he will respond: "Time's wastin'. He's safe... for now." When asked about the precious heirloom he will provide you with a surprisingly brief description: "Yeah. It's a battleaxe with the word 'Dragol' carved into the haft. Huge. You can't miss it. I ain't gonna draw you a picture." When you tell him you are ready to get on the boat, he will point you in the right direction: "Fine. I have it waitin' for you at the dock next to the magic shop. Now get outta my sight." After the boat trip to Fort Grief Island, you will encounter Aleron Loche wandering around amid all the skeletons near the tower. When asked, he will inform you that you made the wrong decision and that you are now part of a dangerous game, arranged by Kurdan: "It appears as though Kurdan has tricked another poor soul with his 'axe' story. You haven't guessed it yet? There never was any Axe of Dragol. It was just a ruse to lure you out here. You're now the prey in Kurdan's insane hunt, just like I am. And here, we'll most likely die." And he will elaborate about Kurdan and his hunt: "Kurdan doesn't make most of his money being a simple usurer. He also invented what he calls the Hunter's Run. People pay him a great deal of money to hunt and kill living human prey. No questions asked, and he takes care of the bodies. He uses the dungeons under Fort Grief as the hunting grounds. I was placed here because he knew someone would go looking for me." He will finish the conversation with the words: "Kurdan is treacherous. Be wary, friend." When you surface from Fort Grief after having dealt with the three hunters, you will witness Kurdan kill Aleron in cold blood. After the deed, Kurdan will walk up to you and engage in conversation: "I'm impressed that you killed all my clients. Doesn't matter. More will come along with their purses fat with gold and hearts lustin' for blood. Too bad about Aleron. Didn't need him anymore now that yer here. At least now he's free of his debt... ha ha ha ha!" He will also inform you that it is quite impossible to ever win his game: "Do you really think I could afford to let you leave here? The key you found is a fake. No prey has ever left this island alive. And I aim to keep it that way. You were right about one thing though... This IS my game, and I'm changin' the rules!" He will then draw his weapon and attack. Kurdan should sleep from midnight until 6am, but all of the beds in the Lonely Suitor are owned by other people. This results in him wandering in a very odd pattern and quickly returning to the same spot on the second floor during those hours. Esta página foi modificada pela última vez à(s) 22h54min de 8 de janeiro de 2015.